It appeared on Facebook on June 7 and it went viral: 422 people left comments and 233 shared it all over Facebook. Then others shared it. It took on a life of its own. Who didn't see it? “It” was a photo posted by California farrier RT Goodrich. "It" was a hoof that had been dimpled all over with holes. It looked for all the world like a hoof made of Swiss cheese. RT has shared the story of this photo with The Hoof Blog. To begin with, RT had never seen the horse before and didn’t know the owner. A friend told him about a neighbor's horse that was in really rough shape and might be euthanized after receiving an unusual treatment for laminitis. The owner was in distress. After listening to his neighbor’s pleas, RT agreed to go look at a foundered horse that belonged to a friend of a friend--and you know how those usually go. But even RT was surprised when he found a Quarter horse who was severely lame with laminitis but whose hoof wall had been dimpled all over with a ⅜” bit on a power drill. The surface of the hoof wall looked like Swiss cheese. What he found even more confusing was that there was nothing on the bottom of the horse’s foot. The horse was in pain. The owner said that she did not intend to call the vet again who had drilled the holes. Could RT help? When these things happen, there’s nothing to do but roll up your sleeves and do what you can for a horse that might not get any help unless you do it. RT said that he thought what he did was safest for the horse, whose owner didn’t have the funds for a full medical treatment, radiographs, and frequent farrier visits. It was far from an ideal situation for the horse, or for the farrier who found himself in a classic "da*ned-if-you-do-da*ned-if-you-don't" situation. But when RT left, the horse was definitely feeling better and the owner was calmed down. “This is the second one I've seen (treated like this),” RT said. 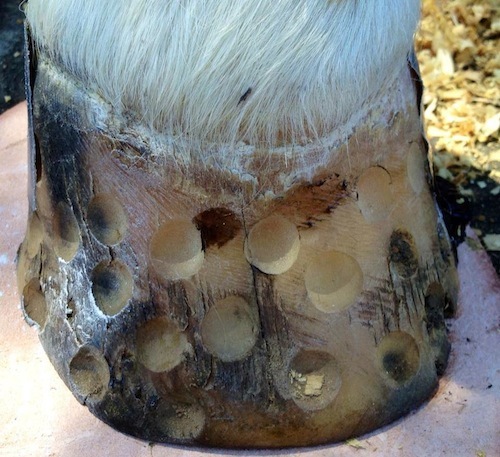 “The first one sadly ended up in the shop getting dissected.” Some laminitis treatments involve grooving or drilling holes, but they would penetrate the layers of the hoof wall to the laminae, like a partial or localized resection. RT didn't have any information on the rationale for the treatment, or know of any horses that had been successfully treated this way. Maybe some blog readers will have more information. When RT first visited the horse and met the owner, he did what he could to make the horse immediately more comfortable. “She is a game little mare. I poured Vettec Sole Guard in the back half of the foot and it gave her some relief,” he said. When he came back, he removed the Sole Guard. “I filled the drill holes with a tongue depressor covered with Equilox; the holes extended from heel to heel and from the coronary band to the ground. “I shod the horse with heartbars. I don’t like using heartbars without radiographs but in this case I didn’t have the option. I used really tiny race nails. I did a full pour with Vettec Equipak Super Soft. Happily, she walked off. Now we wait. I am not opposed to starting over completely with a different treatment if this doesn’t work." RT knew that money was a problem, so he did not charge for his work. He said he'd rather have the owner use the money to pursue treatment of the cause of the laminitis, which she did. This video shows the mare on July 12, 2013, approximately one month after RT Goodrich first worked on her. What bothered RT (and me), and why we wanted to share this story more than anything was probably the way that people on Facebook responded to seeing the photo. There is no doubt that this is an unorthodox treatment for laminitis, but people on Facebook seemed to use this one photo to unload all their negative thoughts about all people who don’t share their personal approaches to laminitis. They even did it in multiple languages! Worse, many people assumed that it had been RT who had done this to a horse, since it was posted on his farrier business page on Facebook. That is simply not true: He had found the horse this way, and apparently this is a treatment in use by some veterinarians around the country. According to what the vet told the owner, and the owner told RT, his explanation was that he was drilling the holes “to relieve pressure”. He shod the horse at the owner's request, not as a pushback against anyone or any theory. 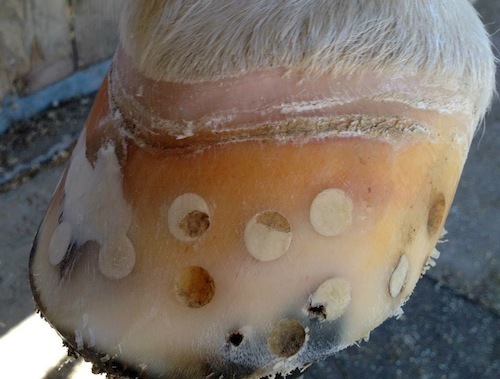 A month after receiving medical support and wearing heart-bar shoes with pour-in pads, the mare's hoof shows growth at the top, although the configuration of the hairline is still not normal at the toe. You can see the line where the mare had tried to slough her foot before she received treatment. RT said that some of the holes are re-growing from the inside out and the Equilox used to fill them was popping out. "There was so much new growth I did not re-fill any of the holes," RT said. 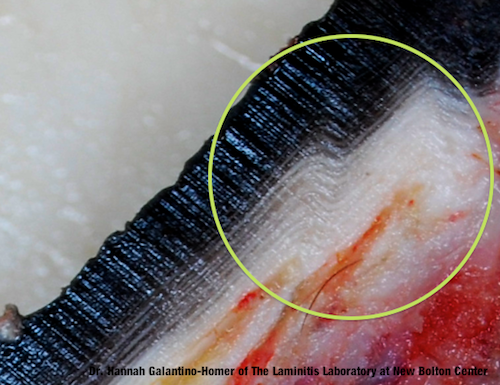 "(It is) interesting that the area where compression was likely -- the kinked tubules up by the coronary band -- was not touched and (there is) no evidence that any of the holes hit the lamellae or terminal papillae, so (it) seems very unlikely to have any positive or negative effect other than disfiguration and weakening the hoof wall. "If the horse has significant lamellar wedge formation (which seems likely based on that founder ring), those holes could be many millimeters distant from sensitive tissues (e.g., not at all comparable to trephination of the skull to relieve intracranial pressure - those holes go all the way through). "Disclaimer: I am not a farrier; I am basing comments on pathology experience, and not making any suggestions about treatment. I would love to have seen radiographs." This is one of those cases where we don’t know the whole story and probably never will. What matters is that RT was generous enough to help a horse and horse owner in need. He never dreamed that the hoof picture would cause such a stir; his initial hope had been to share something in case other people come across this treatment. This case is a perfect example of the way that laminitis works: to beat it, you must both stabilize the horse medically, and address the foot mechanics. 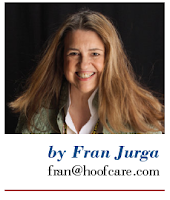 Laminitis shows up in the feet, but it takes more than a good trim or a nice pair of shoes before you will hear the owner's happiest message on your voice mail. RT Goodrich is a farrier by day -- and a musician by night. His North Bay Farrier Service is based in Fairfax, California, where his wife owns Marin Tack and Feed. He’s a good person to know. I'm not quick to judge because I've been around a long time and seen and heard of many laminitis practices and thoughts over the years. Bennie Chapman saved many horses with his procedure and had many critics his entire career. That said, I can't get my head around how this procedure would help a horse in any way at least not without support on the bottom of the hoof. Good job jumping in and doing all you could to make the horse comfortable and very possibly saving the his life. I hope in a couple of years you drive past the place where this horse is boarded and see him playing in a field, that type of payment is the greatest of all! If your ever in my area please stop by as I'd like to shake your hand! Thank you for following up on the rest of the story! Thank You for your diligent work to correct a Very life threatening problem. I have never seen any Vet damage or weaken a hoof wall like that and would have second doubts about a Vet doing this to my horses! I thank the Lord you took the responsibility to do this work, and ALL will end well for the little mare. Yes...the sad part was how the photo was shared to support various agendas. As I had said at the time of posting -- yes I had done this many years ago, but only a 3-hole process (into the laminae) with a block. Yes, to attempt to relieve pressure without resecting...problem with full resections is that they so weakened the toe that you often went from a rotation to a sinker. This of course in an era when resections were a popular treatment. And thanks Fran and RT for some balance in the discussion. Kudos all around. Love the photo of the "kinked tubules" - I've never quite been able to explain this to a horse owner (and that it doesn't mean the hoof capsule is going to fall off today). I am bothered by seeing the owner lunge the horse in small circles so soon after the initial treatment by RT when laminar attachments are still likely quite weak and can be stressed by "tight turns", etc. Too many people feel that because a horse will move off that the horse is "sound". 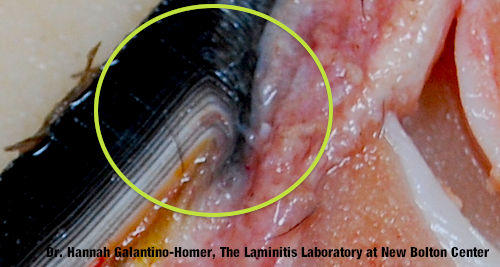 Many of us working with laminitic horses don't consider them "sound" until they have at least one hoof capsule regrowth with tight laminar connections. I'm not surprised that RT took this horse on, nor am I surprised that he was able to save her. I am continually amazed by the miracles he works but I suppose, by now, I shouldn't be. Further, knowing him personally, I can say he is a man of unquestionable integrity in addition to his outstanding professional skill. Please please stop this awful practice. I cannot even bring myself to read the article. Get someone who knows what they are doing. Take the shoes of, feed the horse horse food, treat the horse like a horse out in a free range paddock. It does not cost all this money please please stop!!!! Maybe you should read the article Judi, then you would have some understanding of what you are making pointless comments about. I agree that Judi should read the article in full but I also agree with her regards removing the shoes. This is a typical mediaeval farriers practice which causes as much damage as the drilling. Fran, thanks for posting this clarification and RT, thanks for doing this good work fixing the swiss cheese hoof. This photo keeps popping up on FB (in March 2016), with no explanation, and usually dissing farriers for this so-called treatment. Farrier to the rescue, and kudos for that! I disagree with you Timothy. My gelding and my mare are older animals, 36 and 25 and without shoes they are footsore and tender..it is barbaric for me to ride them without shoes..